There’s no denying it. In Marrakesh, they love Indians. Everywhere I go, people call out to me: “Indienne—you are welcome in my country!" And then, completely arbitrarily, “Kabhi Khushi Kabhie Gham!" “Shah Rukh Khan!" “Amitabh Bachchan!" “We see very few Indians in Marrakesh," an elderly gentleman I meet in the souk tells me wistfully. “And here in Morocco, we love India." I tell him that if I shut my eyes for a quick second and then open them again, I can actually believe I am in India. The heat, the crowds, the noise. The sweaty bodies, the narrow lanes, the speeding bicycles and scooters. Even the somehow familiar Arabic pop music blasting from the shops. But then the elderly man and I agree that Marrakesh is also totally unique. Its Grand Souk is one of a kind—in exactly the opposite sense to, say, Dubai’s Mall of the Emirates. This centuries-old labyrinth of lanes, which forms the core of the city’s Old Medina, is the heart and soul of Marrakesh, a cornucopia of sights and sounds and smells I will never see or hear or inhale anywhere else in the world. One lane has carpets in all sizes, shapes and colours. Another has mounds and mounds of silver jewellery. 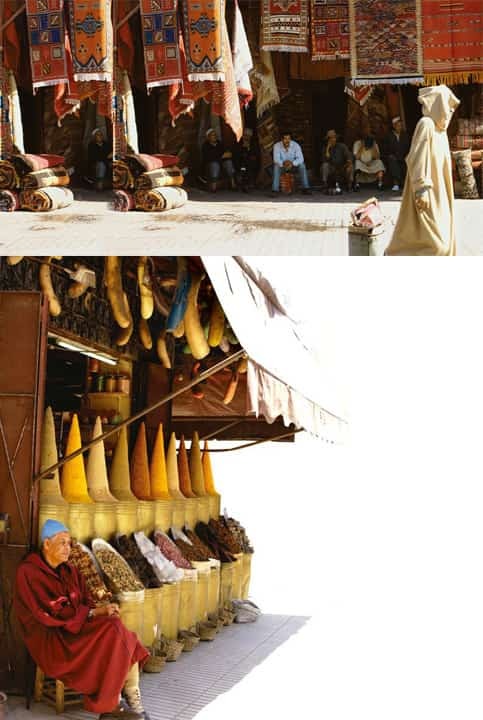 A third carries only babouches, the soft leather shoes favoured by Moroccans. The colours are dazzling—canary yellow, royal blue, silver and aquamarine. They carry over into the leather handbags I find as I turn the corner, an endless array of perfectly finished creations in fuchsia, turquoise and emerald green, finished with the most exquisite trimmings and adornments. “How much?" I ask, for a rust suede satchel with crimson embroidery. “500 dirham," the young man tells me. He starts high, knowing that I will bargain; it’s the done thing here. “No," I stand my ground. “300. Yes, 300. That’s my last price." “Okay, Yallah, take it for 300 then," he says good-naturedly. Observing people in the Grand Souk can be as intense an experience as shopping. Old men in hooded djellabas sit outside food stalls sipping cup after cup of sweet mint tea, watching life go by. Berber women with covered heads and tattooed chins sell slabs of spongy lemon cake and almond macaroons from large trays held at their hips. Young girls in jeans walk past, chatting on their cellphones, indistinguishable from young girls almost anywhere in the world but for their colourful headscarves. Housewives in elegant silk kaftans, their eyes lined with kohl and their mouths painted red, haggle over the price of fabric. Young men with beards grill kebabs and bake flat breads. Dark tribesmen from the Sahara sell djembe drums and, of course, there are the stately Touareg, clad in their signature blue, who sit silently by their wares. In the spice lane, turmeric, paprika and chilli powder are piled high in perfect cones. I admire the rough slabs of kohl, the baskets of rose petals and potpourri of fragrant mountain flowers. I draw in the scents of cumin, dried mint, saffron and fresh henna. I ask about the beauty quotient of black soap and huile d’argan, a natural oil (from the argan tree) from the south of the country that Moroccans swear by. “What’s this for?" I ask, pointing at a piece of jagged black rock. “Pour chasser le gris-gris—to chase away the blues," the Berber vendor says. He beckons me into his cramped stall and opens an old tin box. It’s full of scorpions itching to emerge. I recoil instantly, but the vendor urges me not to be afraid. “Buy one," he insists. “Set it on fire with the black rock and you will feel better about life." It is easy to get waylaid in the souk and it’s easy to get lost. I round a corner and find myself in the middle of a noisy crowd of men selling snakeskins. Around another and I stumble in on a Berber auction. A throng of women, some with only their eyes visible, sit in concentric circles around men holding up carpets. There is a sweaty intensity and purpose to the raised, controlled voices that completely overwhelms me. “Madame—would you like to see the Berber tanneries?" someone behind me asks. Visitors to Marrakesh are always cautioned against accepting such offers, but I am so eager to get out of the crowd, I’ll follow anyone. The young man leads me out of the cool confines of the souk into the afternoon. The Marrakesh sun is baking hot, but the city, with its low rust-red buildings, is sublime. This colour is de rigueur in Marrakesh, my guide says, even in the newer parts of the city. And then the stench from the Berber tanneries overpowers me. “Here," says Hassan, who has worked there since he was a boy. “A natural mask for you." I stuff my nose into a bunch of fresh mint and look out upon a vast expanse of camel, goat and cow skins stretched out in the sun, listening as Hassan explains how they will eventually end up looking like the handbags and jackets I saw in the souk. My guide takes me on a circuitous route back to the centre of the Old Medina via the tombs of the Saadien kings who made Marrakesh their capital, and the Bahia Palace, which apparently belonged to the favourite slave of Morocco’s beloved King Mohammed V. When the slave died, the palace was ransacked, its treasures looted and pillaged. “Shall I show you how to get to the Place Djemaa el Fna?" my guide wants to know. This time, I say no, I can find it myself. Indeed, there is no way I can miss the centuries-old central square of Marrakesh’s Old Medina: All of Marrakesh, resident and visiting, heads to this United Nations Educational, Scientific and Cultural Organization (Unesco) World Heritage Site in the late afternoon, the crowds increasing as the skies get darker. Food vendors stoke their fires. Juice sellers squeeze oranges and grapefruit. Handcarts on the outskirts of the square threaten to spill their load of almonds, figs, pistachios and olives. 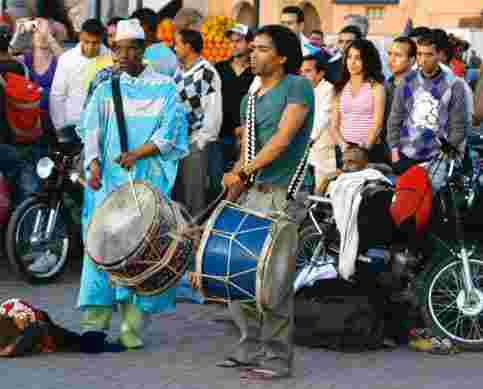 Further along, a group of musicians from Mali are entranced by their own drumbeats and several gnarled old men try to convince tourists to sample a bowl of fresh snails. Acrobats and jugglers perform their acts, actors and storytellers narrate their skits. Snake charmers playfully attempt to curl a python around a passer-by. The sounds of drums and flutes combine in the smoky air as the evening breeze lightens the afternoon heat. The muezzin calls out from the mosque, but only a few faithful heed his summons. The rest, such as me, are too deeply caught up in the action. “Yes," he smiles. “You. Come, khaana taiyar hai (the food is ready)." “Oh no, I can’t eat a single thing more," I reply with a smile. “Okay," he says. “But remember for next time, stall number ek sau chauda." “Sure," I say. And I mean it. Apply for a visa at the embassy of Morocco in New Delhi (www.moroccoembassyin.org). Single-entry visas cost Rs1,450. Fly Emirates to Casablanca and catch a connecting flight on Royal Air Maroc to Marrakesh for Rs53,000 from New Delhi or Mumbai. Marrakesh has its share of good hotels but to really experience the city, staying at a ‘riad’ is a must. These former homes of the city’s top families in Old Medina have now been converted into hotels, with rooms and suites starting at around €180 (around Rs11,340) per night. Almost every ‘riad’ in Marrakesh has a hammam, or steam bath, offering traditional Moroccan beauty treatments. For an authentic and genuine hammam in the heart of the city, try Hammam Ziani (www.hammamziani.ma). A package deal, complete with an hour-long scrub and massage, goes for around €40. Or head to the higher-end Les Bains de Marrakech (www.lesbainsdemarrakech.com), where a simple massage starts at double that price. While most restaurants in Marrakesh offer the city’s signature dish, the Tanjia (tagine), it is best experienced in the heart of Old Medina, at simple eateries such as those located opposite the olive stalls in Souk Ableuh, a small square just off the Djemaa el Fna. Tanjia is the urn in which the meat of one’s choice lamb or beef—ordered a day ahead—is cooked slowly for hours in the furnace that stokes the local hammam. Beyond Marrakesh: A first-class train ticket to Casablanca, 3 hours away, is only €12. This city by the sea is now known mainly for the magnificent Hassan II mosque, but its many street-side cafes and art deco buildings are reminders of its elegant past and Morocco’s long-standing relationship with France. The town of Taroudant, which Moroccans fondly call Le Petit Marrakech, is about 3 hours’ drive from Marrakesh, through the majestic Atlas Mountains and past Berber villages. Anyone going to Taroudant must eat at Riad Maryam (www.riad-maryam.com).